Spotted this black boxeye beauty at my local Shell station this morning. That cold almost be me - right down to the lifted numberplate and cut off rear guard and the white wax chain lube. BUT not in your area and I would NEVER leave my lid sitting on the seat like that. the chain was actually a really shiny silver, unfortunately the picture doesn't show the bike that well as it was a screen shot from my video footage this morning. It must be a Fazer spotting day for me as after seeing the black boxeye beauty this morning, I popped out for lunch and spotted a bright red foxeye. Not sure if it was a 600 or 1000 as there was a bush in the way so I couldn't see the engine design. Found this yellow one in the work car park this morning. Was alot cleaner than mine. Silver Foxeye on the gravel section of the A6 southbound between Matlock Bath and Ambergate yesterday around 11 am. I was going the other way. If you worried about falling off your bike, you'd never get on. Was anyone riding a red boxeye coming from Baggy Point in Croyde a few days ago? I saw one go past the campsite I was staying at (mine was the black and silver FZ6). Early red Boxeye with an aftermarket pipe going through Cambridge around lunchtime today. Spotted it again the next day parked up in town. The exhaust is a Blackwidow. '03 plate Blue 1000 Fazer spotted today near Bexhill college around 4pm today! Smart looking blue thou on a 61 plate parked at the Broadcast Centre, White City yesterday. If the owner’s on here, you'd left your lights on. Fortunately (apart from the total lack of security aspect), one size fits all when it comes to Fazer ignition keys so you weren't faced with a flat battery at 5:30. Black boxeye about 4.20 today in Rugby, on the A426 near Tesco. The guy was standing next to the bike, which was at the side of the road with the front end smashed up. I stopped to see if he was ok, turns out he'd just been knocked off by a white van and dragged up the road by a lorry! He'd injured his back, but ok other than that. Said the ambulance, police and AA were all coming so I wished him all the best and left him to it. Hope he got home ok.
too fucked up to care any more. Not today, but Monday. Pulled into Halfords car park (Queens Road Sheffield), noticed another bike there so parked next to it. Turned out to be my bikes twin - another 2001 gold, black and silver boxeye. Had a few more bits than mine (crash bars, heated grips, scottoiler) but was the same other than that. Talked to the owner, said hed got a BMW as well, but hardly used it as he preferred the Fazer. A boxeye 600 passed me on the M4 going into Wales this afternoon (I was in my cage), he was hunkered in tight and overtook. He then went into the wrong lane at the toll boths - he went into the automated one for cars - and looked confused by the lack of of toll taker. He did repass me again eventually; I guess he had to use the intercom to get let through. 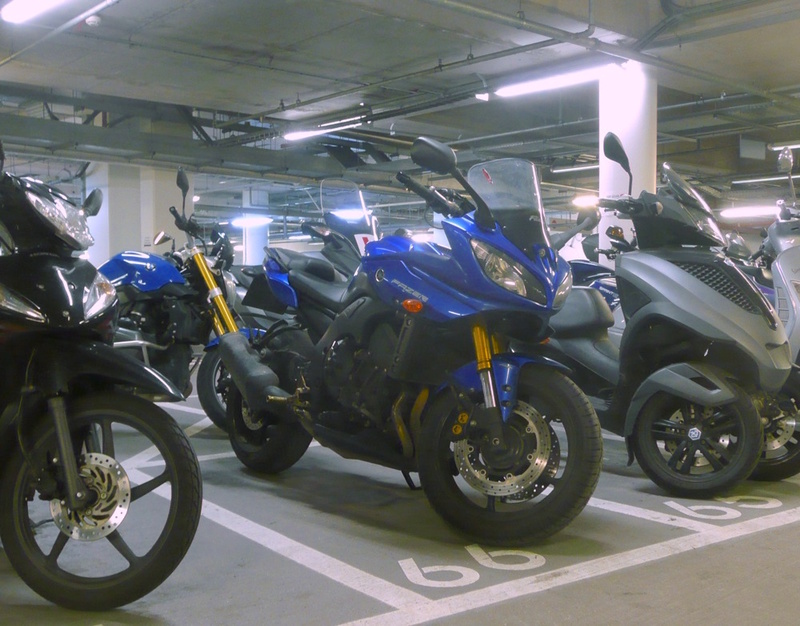 Coming back from the MOT on Saturday (passed with only an advisory on lightly scored discs) I passed a gaggle of CBT students being shepherded by an instructor on a boxeye pretty much identical to mine. He didn't seem to want to return my nod of appreciation as I passed him though. Silver Foxeye heading southbound on A1 passing Metrocentre yesterday around 5ish. Not today but last week while i was in Blackpool on holiday there was a guy on a Black Boxeye doing MOD 1 training in the carpark next to our hotel and the instructor was on a Gen 1 Fazer 1000. Then on our way home I spotted a Gold Boxeye on the M6.